Coverage is exactly "United States Army Air Force"
Main wheel assembly of B-29 on the ground, captioned, 'Main Gear'. The inside wheel is chocked with a wooden block. The nose gear can be seen in the background. Nose wheel assembly of B-29 on the ground, captioned, 'Nose Gear'. The wheels are chocked with wooden blocks, joined with rope. . Hangers and further aircraft can be see in the background. Wright R3350 Engine and Hamilton Standard Hydraulic Prop. Front view of aircraft engine and propeller, captioned, 'Number Three Nacelle with Bird-Plug. Wright R3350 Engine and Hamilton Standard Hydraulic Prop'. The engine is not running. Buildings and further aircraft can be seen in the background. 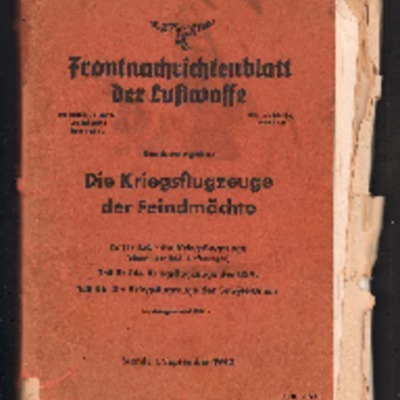 Account of Lancaster operation to Munster and Rheine railyards and Bremen oil refinery. Munster rail yards underlined. Captioned '21-5-45'. 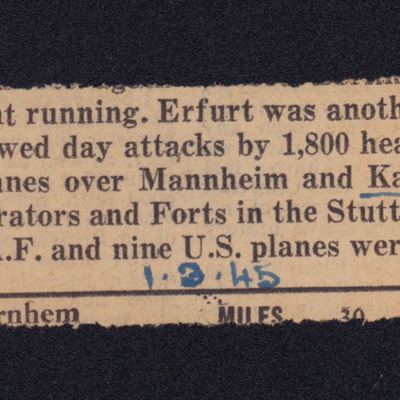 Account of Mannheim and Kamen daylight operations. Kamen is underlined. Captioned '1.3.45'. 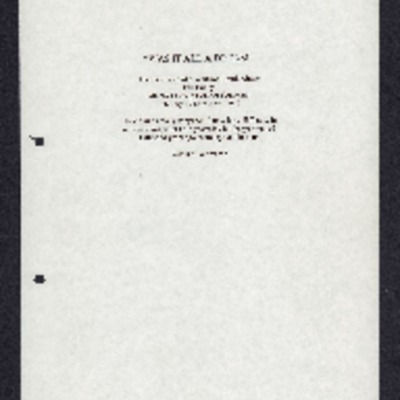 Item 1 is a typed entertainment programme for 35 Squadron at Westover Field. 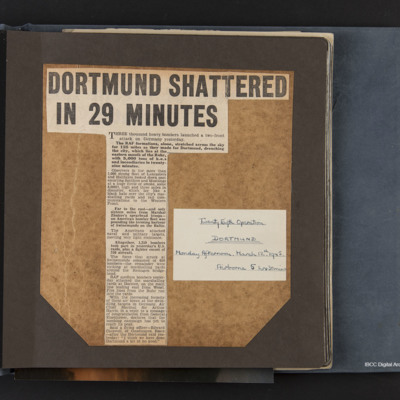 Item 2 is a newspaper cutting about 35 Squadron and their social activities. 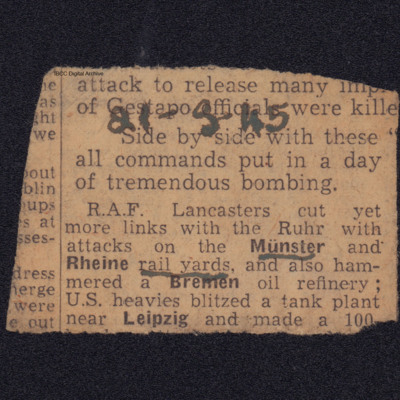 Item 3 is a newspaper cutting titled 'RAF Open House to be today at Westover Field'. 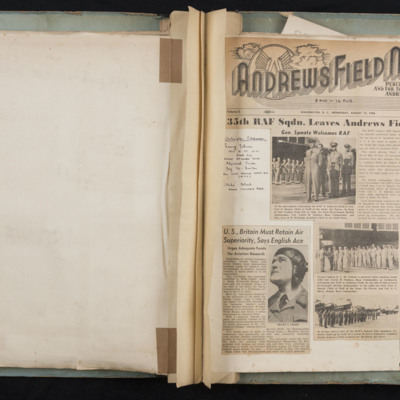 First item is an account of the the visit by 35 Squadron at Andrews Field. Second item is 'U.S., Britain must retain air superiority, Says English Ace'. Handwritten notes of Washington addresses. Photograph 1 is Grauman's Chinese Theatre. 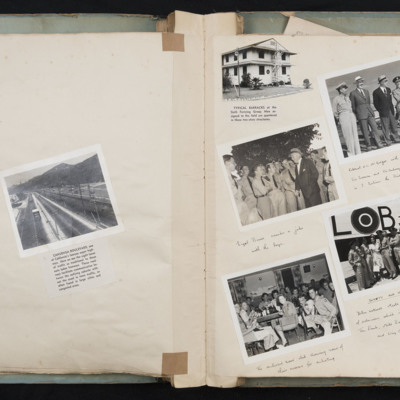 Photograph 1 is a motorway, captioned 'Cahuenga Boulevard'. Photograph 1 is a street view captioned 'Looking East on Pacific Avenue, Long Beach'. Photograph 1 is an aerial view of Long Beach Pike with a printed caption. Item 1 is a letter to 35 Squadron from the commanding officer at Long Beach. It dedicates an album to the airmen of 35 Squadron. Item 1 is 'Roger Jr', a programme of evens of Army Air Force Day. Item 2 is a printed leaflet welcoming 35 Squadron to Washington. Photograph 1 is of a line of Lancasters with airmen standing in front. 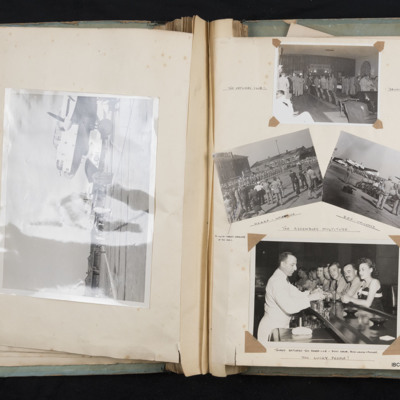 Photograph 2 is a view of the party captioned 'The Officers Club Drinks all round'. Item 1 is orders for personnel at Mitchell Field. Photograph 1 is a line up of airmen in front of two Lancasters. Photograph 1 is a Lincoln flying over New York, captioned 'Over New York 1947'. 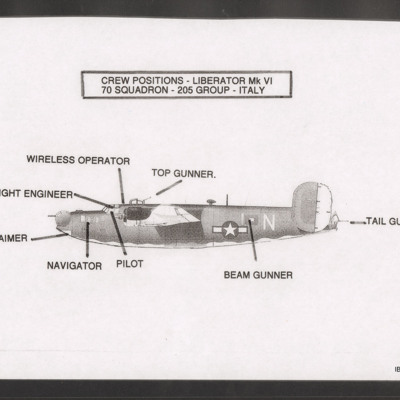 A port side image of a B-24 Mk VI showing the eight crew positions.